The first time I run into the notion of digital dividends was at the end of the last century. At the time, the first dot-com boom still running at full steam, totally unaware of the looming crash. 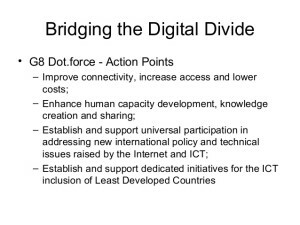 Building on the hype of the new technologies and of the Internet, in particular, the G-8 launched the Digital Opportunity Task Force (aka DOT Force) in July of 2000 with the primary purpose of closing the global digital divide and universally spreading digital dividends to all. 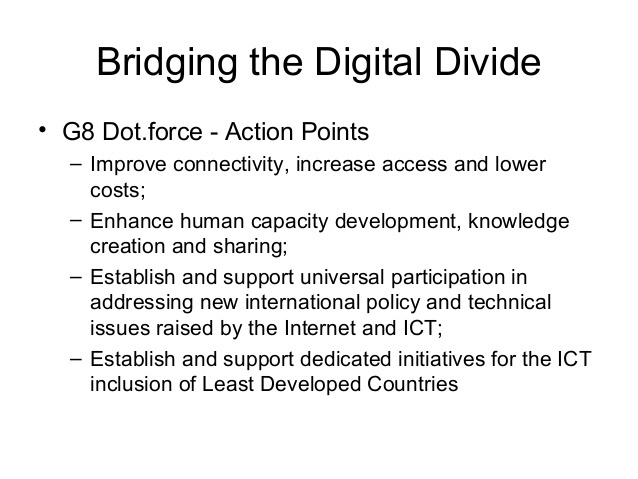 The DOT Force was not limited to G-8 governments. By design, it also included governments from developing countries, the private sector, and representatives from civil society, thus foreshadowing what is now known as a multi-stakeholder approach. The final report of the DOT Force was approved at the G-8 summit in July of 2001. The report had nine key recommendations which were labeled as the Genoa Plan of Action. 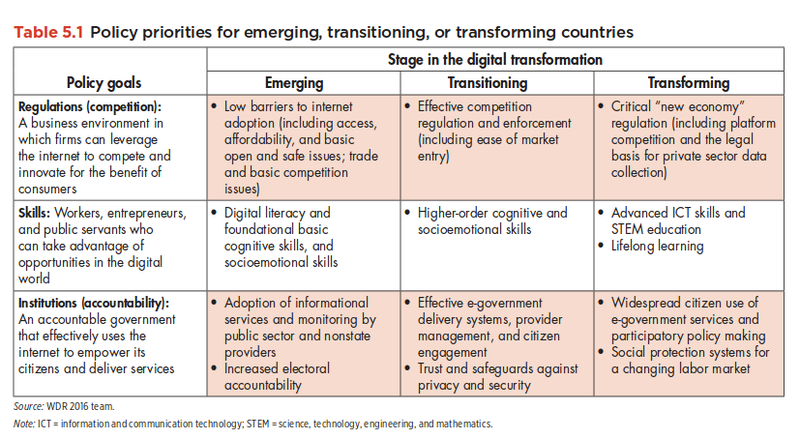 This set of recommendations covered a lot of ground including policy development, connectivity, skills development, e-health, and Internet Governance to name a few. 1 Some of them served as pillars to create new initiatives such as the e-government for development programme (PDF) and the UN ICT Task Force among several others. 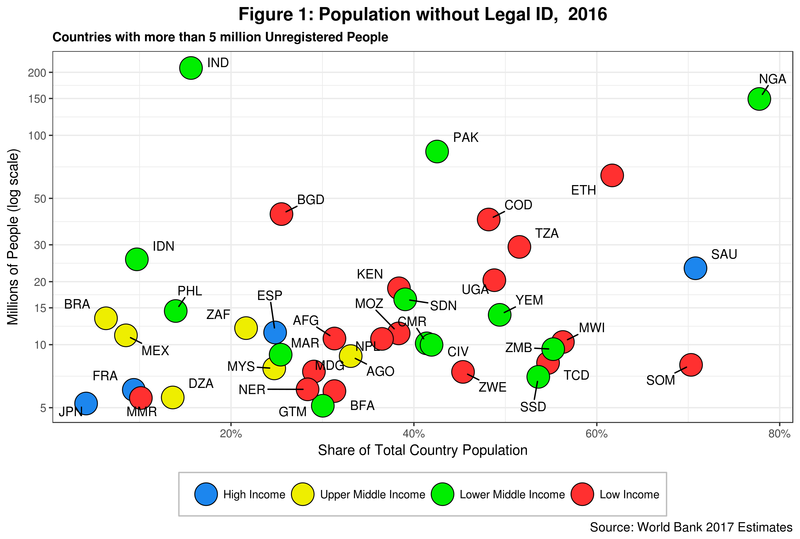 In my view, this is a crucial step forward as it reinforces the perspective, held by UNDP since the late 1990s, that ICT access and use are not goals themselves but rather enablers that can foster human development -and not just economic growth, under specific contexts and environments. We can surely close the digital divide, but that alone will not reduce poverty, inequality, corruption, injustice, gender inequality, etc. Additional ingredients are required to make this happen. As an example, let us consider inequality, a hot topic since the 2008 global crisis. 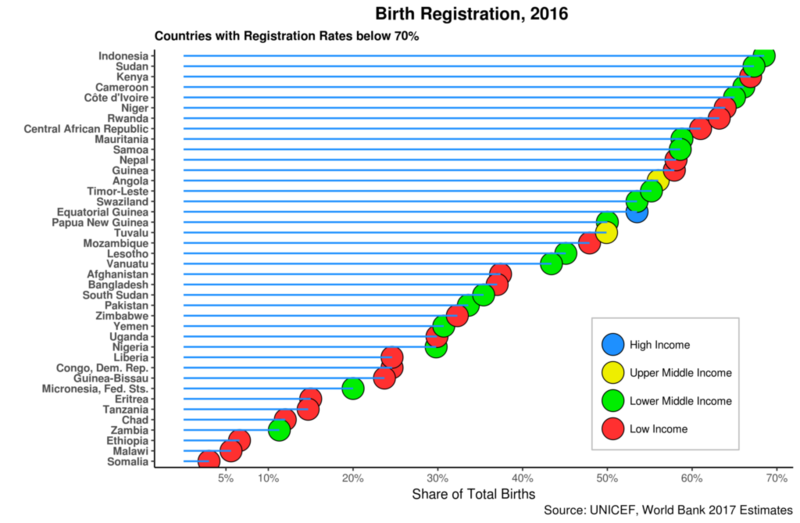 While the Internet and especially mobile phone penetration have been growing relatively fast so has income and wealth inequality in most countries of the world, including industrialized countries. So what are the so-called analog ingredients? The report identifies three core areas: 1. Regulations; 2. Skills; and, 3. Institutions. These are soon equated to favorable business environments, strong human capital, and good governance, respectively. These together constitute “the foundation of economic development” (pg. 4) 3 The internet, in particular, is key here as it can promote inclusion, efficiency, and innovation. What are then the required policies that ensure digital dividends for all are in fact delivered? There are three levels of analysis here. The first is the assumption that each of our three foundational pillars is linked to a particular agent or sector in society. Accordingly, regulations refer to the business sector, skills to people and institutions to governments. The second level established an overall outcome for each of the three analog foundations. For regulation we aim is to promote competition and entry. Governments, in turn, should become more capable and accountable. Finally, people should be able to capitalize on the new digital opportunities. With this in hand, it is now feasible to provide policy recommendations for our three foundational pillars according to the type of country under analysis. 5 Twelve policy recommendations are suggested. The question we can now ask is: how viable are such recommendations? How innovative? Take the recommendation on lowering import tariffs for ICT products in “emerging” countries. This is a topic that has been on the table since the late 1990s. This issue is much bigger than just import duties. It should be part of broader national fiscal policies that also encourage increasing public revenue to make up for the decrease in tariffs. If we are asking emerging countries to have powerful regulators, build skills for most people and improve public service delivery then recommending fiscal policies that allow governments to do all this and more are also required. Seeing import tariffs as a standalone issue misses the point. Recommendations on competition both sectoral and of platforms are spot on. The set of recommendations on skills development are not new. Most of these have been already addressed by other reports and processes such as the aforementioned Dot Force and the WSIS action plan, to name just two. There are a couple of issues here. First, we need to move beyond skills and instead address capacity development. The latter includes not only skills but also institutional settings, leadership, empowerment, and people participation in decision-making processes vis-à-vis governments. Note that a few of these are part of the report framework. Second, are we only talking here about ICT or digital skills? Probably not but we need to be clear that capacities to run public institutions, private companies and civic engagement are also required. It should not thus be limited only to digital opportunities. If countries need to have strong regulating institutions, then related capacities must be in place to ensure the former can deliver the goods. In this context, skills or better capacity development should be a cross-cutting factor. The introduction of the institutional pillar is innovative as are some of the associated policy recommendations. What seems to be missing is the concept of institutional development fundamental to have a healthy and democratic public sector which can sustain the recommended policies in the medium and long run. The report mentions the idea of a capable public sector, but the question for say emerging countries is how to create such a sector. What are the policies and mechanisms required to build strong democratic institutions? For sure, this could be the topic for another report. 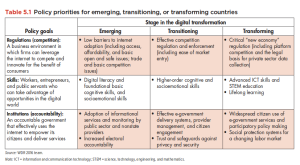 In any event, it seems clear this pillar has different policy and skills capacity requirements where ICTs can also serve as critical catalysts. But the report does not provide any hints on the topic. The latest WDR is both comprehensive and ambitious. It covers a lot of ground which in itself is useful to a vast array of stakeholders ranging from policymakers to development practitioners. However, the report seems to run into trouble when it comes to interlinking the various policy recommendations. This appears to be the result of identifying the three analog foundations with specific sectors on a one to one basis. So regulation, for example, applies to the business sector; and citizen participation and accountability to governments. Skills, in turn, affect all people, regardless of sector. This does not need to be the case as, say, regulation, as a pillar on its own, demands strong institutions that have adequate skills to develop, implement and enforce policies. In turn, a capable public sector that can deliver services and involve people in governance processes demands strong institutional and individual capacities or skills alongside public policies that create the adequate environment to achieve such goals. And so on. In the end, the report has a lot to say about ICTs and the Internet and is thus an essential contribution to the field of ICT for Development. But it does not really add much on the “analog” side of the equation as the conceptual approach here is pretty much in the mainstream. This is perhaps best reflected in the three core dividends the report highlights: growth, jobs and service delivery. In this context, perhaps the report is targeting policy and development practitioners who are still skeptical about the real effectiveness of ICTs and the Internet in traditional development programmes and projects. ← A “social” history of Bitcoin?